IRONHIDE COMMUNITY FORUM • View topic - Which Iron Marines Hero is Your Personal Favorite? Re: Which Iron Marines Hero is Your Personal Favorite? It’s a tough one for sure. I like that Trabuco is a man of pure combat efficiency, but something still seems off from him. Same with Mark X; he lacks the feel of an all-powerful war machine which I think they were going for with him being the expensive-dragon-equivalent of Iron Marines. It’s something I want to try to do better myself in fanfiction soon. When it comes down to it, I’m the biggest fan of Dr. Graaff. I’m reluctant to say this because both of his passives (an XP ratio boost and a health boost) are stupid, but using him in-game is just super fun. I like that with his droids, he can destroy things with even better damage than Fate’s time bomb. His abilities have no cooldown (which should be stated in the hero room, especially the incorrect “regular” speed of his explosive ability) and only rely on the bots. It’s pretty unique and I love the feel of this slow but incredibly powerful robot that can quickly wipe out enemies in a burst of power. Shoutout to Guiying as well fo being super fun, even though Stellar Dragon doesn’t feelt useful to me. 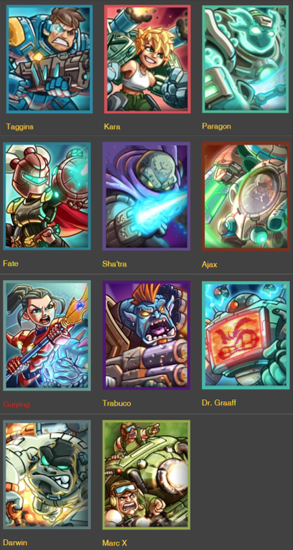 Agree with BBB..Dr Graff for the win..his healing is pretty nifty too..Trabuco I found his laser was pretty inferior to the shotgun plus his eterium skill has a long animation...but do I think the heroes should have at least 4 skills?